"I can't stress enough how much better this is if it is stirred constantly. If one arm gets tired, switch arms. Taste the rice for doneness before serving. Nothing worse than a plate of crunchy risotto. Try it, and you will find it is well worth it!" 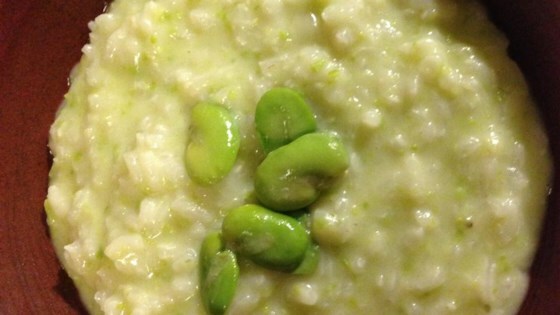 Excellent; I tried this recipe, however with pine nuts instead of fava beans; te result was a rich risotto with a mid-eastern twist!! !